A male monkey cruising through the grasslands with a harem of females all to himself might seem to have hit the primate jackpot. What simian doesn't want a dozen lady monkeys to bear his long-tailed young and then tote them around? But he's better off sharing the wealth. By letting other males infiltrate his group and mate with his females, the leader lands himself a longer term in office—and more, not fewer, of his own offspring. The gelada (pronounced not unlike the Italian frozen dessert) is a social animal that lives only in Ethiopia. Males have luxurious hair capes and bright red hourglass shapes on their chests. The lucky ones live in groups called reproductive units that include one "leader" male and up to twelve females. About a third of reproductive units also include one or more "follower" males. Unattached males, meanwhile, live in bachelor groups that wait for the right moment to attack leader males and try to take over their women. Attention Marvel: New character concept? Cape is cool but logo needs tweaking. For females, it doesn't much matter which males they're following around. But for male geladas, society is deeply divided between haves and have-nots. Leader males have mates, and therefore babies. Almost everyone else is stuck waiting their turn to contribute to the gene pool. 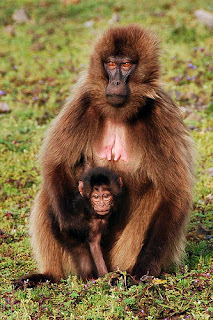 Researchers led by Noah Snyder-Mackler at the University of Pennsylvania wanted to investigate gelada society more deeply. Does a leader male sometimes allow follower males to intrude into his group, and mate with his females, only because it's too hard to fight them off? Or does the leader actually gain something from letting his mates have a couple boyfriends on the side? In a study that will prepare their resumés for future work on daytime talk shows, the team went into the field and did some paternity testing. They collected feces from all the babies born during their three-year study period, as well as the mothers and potential fathers, which gave them enough DNA to find out where all the young monkeys had really come from. They also closely observed the dynamics of the 21 reproductive units in their study population. When did bachelor groups clash with the males in reproductive units? Were the attacked males leaders or followers, and how effectively did they fight back? For how long did leaders keep control of their groups before being ousted by another monkey? The researchers found that leader males could be kicked out of their groups at any time; the longer they stayed, the more likely they were to go. The average leader held onto his group for 3 years or so. While those males were in charge, they kept a tight rein on the females in their groups. Leader males that had a whole reproductive unit to themselves fathered 100 percent of the offspring born. (Impressive, considering gelada groups come together in very large meet-ups—as many as 1100 monkeys at a time—to forage for food. Apparently those conventions are all business.) When follower males were present, all the mating stayed inside the group, but now leaders fathered just 83 percent of the young. Despite losing out on fatherhood, though, leader males experienced a clear advantage when they let follower males into their groups. Followers helped defend the group against aggressors; units with multiple males were less likely to be taken over by interloping bachelors. Consequently, the leaders of these groups stayed in charge for 30 percent longer than males who had a group all to themselves. Units with more than one male also had greater numbers of females. Between the extra mates and the longer time in office, leaders who put aside their jealousy and allowed followers into their groups ended up fathering more babies than leaders who flew solo. On average, leaders with followers had 7 babies before getting kicked out of power. Solo leaders had just 4. Snyder-Mackler writes that systems like the geladas' could help explain how social behavior evolved in mammals in the first place. For the monkeys, playing nice with potential competitors isn't about being friendly—it's a fruitful reproductive strategy. Follower males don't father very many children, but they do better than bachelors. And later, they might become leaders of their own groups. 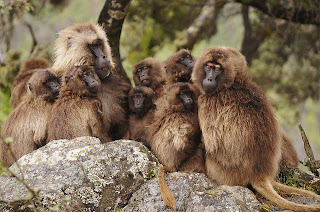 The system benefits female geladas too: When bachelors take over a group, they may kill the babies that are there already. Living in a group with multiple males gives females a little more security for their infants, since the group isn't as likely to be taken over. Females may even encourage leader males to allow followers. After all, a little mate-sharing is the neighborly thing to do. 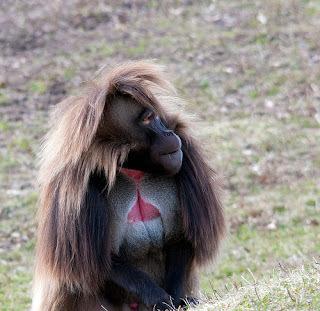 Images: Male gelada focusshoot/Flickr; gelada group dave watts/Wikimedia Commons; female gelada mc_bos/Flickr.